In all honesty, Kurt Vonnegut’s novel Slaughterhouse-Five was not what someone would typically expect, especially if they’ve never read anything by Kurt Vonnegut before. 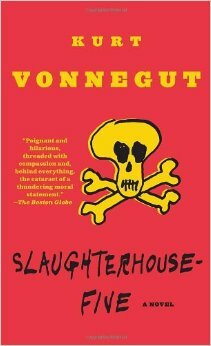 Slaughterhouse-Five, while labeled as an anti-war book, has far much more to offer than simple pacifist propaganda. In this sci-fi/historical fiction novel, a unique narrator (who is also revealed to be the writer of the book early on) tells the tale of Billy Pilgrim, an anti-hero in this anti-war, who’s often described as funny-looking and awkward, but that could just be because of Billy’s tendency of getting “unstuck in time” (Vonnegut 23). Throughout the story, the narrator reveals Billy’s life through non-linear events and explains this as Billy time traveling. The book is mainly about Billy’s life before, during, and after World War II, and more specifically--the bombing of Dresden. Vonnegut’s novel is recognized as an anti-war book, because of the constant negative effects that happen to Billy and the people are him because of the war. During an encounter with Campbell recruiting for “The Free American Corps”, the narrator talks about how “there are almost no characters in this story” and that “one of the main effects of war, after all, is that people are discouraged from being characters” (Vonnegut 164). Vonnegut’s view on war, as made clear throughout the novel, is that it rips away individuality or “character” as used in this excerpt. Vonnegut also expresses another theme throughout the novel; that somethings in life simply cannot change. The Tralfamadorians, the alien species that allows Billy to time travel, explain to him; “All time is all time. It does not change. It does not lend itself to warnings or explanations. It simply is” (Vonnegut 86). Throughout the novel, Billy also adapts this new way of thinking. The structure for this novel is by far one of the most peculiar and unique in literature. It’s non-linear way of storytelling has created an impact on the novel and it’s overall message. The theme of life’s inevitability is reinforced by telling Billy’s life in random order, stating that time is not linear and it does not matter that it’s that way as these events have existed and always will exist. At one point, the narrator describes Billy’s death, and explains that Billy left a recording of himself behind; “I, Billy Pilgrim, will die, have died, and always will die on February thirteen, 1976” (Vonnegut 141). It does not matter that Billy knows he’s going to die; he will die regardless. Another particular detail of the book is the narrator’s style. From the reiterating “So it goes” after every mentioned death to the surprisingly light and ironic way to describe war, Vonnegut has earned his place in dark and satirical humor. The nonchalant style of outlining something as gruesome as war and death adds to the idea of life always existing, and that “when a person dies he only appears to die” (Vonnegut 26). It almost makes the reader numb toward death when reading the same “so it goes” after every incident. As a first time reader of Kurt Vonnegut, this book was completely unexpected. Never did I imagine I’d be laughing as hard as I would and delving into the author’s ironic style as much as I did. While the novel evidently lacked iconic or notable characters (well, except for Kilgore Trout), it still managed to pull some heartstrings. This novel would most likely suit readers who appreciate a witty and satirical narrator, have a keen interest in unique anti-war books, or love reading about psychological endeavors such as creating a fictional universe of Tralfamadorians to cope with the terrors of war. Overall, it's a definite must-read.